What’s the most damaging thing you could say about a candidate for Premier of B.C.? Probably something like: they’ve been bought by foreign interests. They’re aligned with Donald Trump. And if they get elected, you’re going to lose your job. Christy Clark has felt the sting of those accusations herself, having accepted millions in foreign donations from the U.S., China and Malaysia — including the Trump Tower developers. It’s too late to give that money back, so instead the BC Liberal strategy is to smear NDP leader John Horgan with the same brush. Did you see news footage of the rusty old truck following Horgan’s campaign bus at the beginning of the campaign? 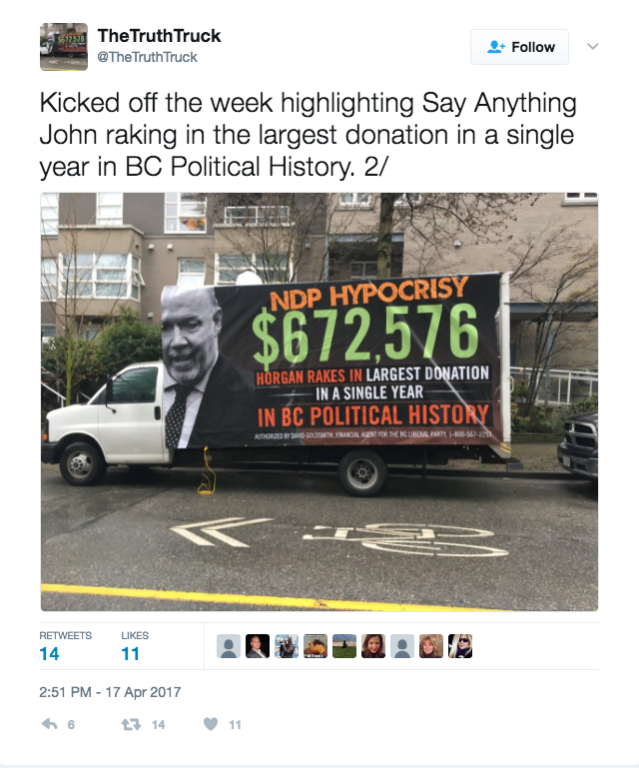 It appeared with a banner reading “NDP HYPOCRISY: HORGAN RAKES IN LARGEST DONATION IN A SINGLE YEAR IN BC POLITICAL HISTORY”. It turns out the truck was being driven by Shane Mills, a senior strategist in the Premier’s office. $672,576 is the total of all the donations to the NDP last year from The United Steelworkers (USW), North America’s largest industrial labour union. Local 1-1937 (based in Burnaby, representing workers in multiple sectors on the coast). The largest cheques came from the U.S. and were signed by USW International President Leo Gerard. Last week Gerard was photographed at the White House standing next to President Trump. Days later the U.S. announced steep duties on Canadian lumber, which will hit B.C. especially hard. Mills across the province are bracing for more job losses. Just like that, Christy Clark has her story: Horgan is in the pocket of the Steelworkers. The Steelworkers are in cahoots with Trump. And Trump is going after B.C. jobs. Do the Steelworkers wield significant influence within the BC NDP? It’s reasonable to think they do. Do they want to kill B.C. forestry jobs? Unlikely, since many of their own members work in the sector. 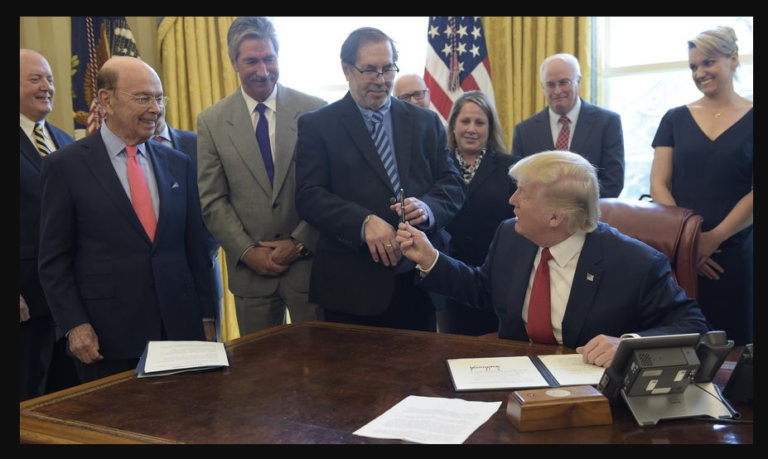 So why was the USW International President photographed next to President Trump? That’s an interesting story. Leo Gerard is actually Canadian, but is based in Pittsburgh and represents workers on both sides of the border. Gerard was invited to the White House to witness the signing of a memorandum by the President ordering an investigation into the effects of cheap imports from China on the U.S. steel manufacturing sector. True, the Steelworkers campaigned against Trump in the election. But Gerard told the Globe and Mail he showed up at the Oval Office for two reasons: to show support for a tougher stance on Chinese steel dumping, and to tell the Trump administration that “Canada is not part of the problem” when it comes to trade. 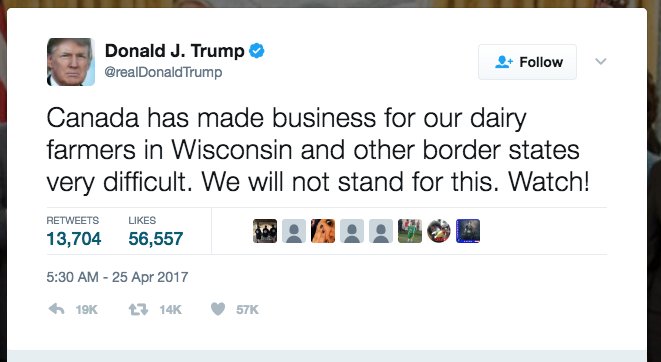 The message may have gotten through on steel, but not on milk or softwood. This week the U.S. lashed out at Canada, imposing steep duties on the lumber used to build American homes. Much of it is felled, milled and exported by unionized workers here in B.C. In other words, if more mills shut down across the province, it will be Steelworkers who lose their jobs. Nevertheless, watch for Clark to bring up the Steelworker donations again and again as she hammers Horgan for hypocrisy. Why? Because it neutralizes her own misdeeds. Never mind the relative scale of the two parties’ fundraising, or the fact the party in power has more to offer its donors in terms of permits, contracts or freedom from prosecution. Never mind the Liberals’ refusal over the last 16 years to change B.C.’s political financing laws. Clark just needs viewers to be left with one key message: “Everyone’s hands are dirty”. By taking big donations from organized labour, Horgan has handed Clark a lasso to drag him down into the same fundraising muck. From there it’s a short step to “all politicians are the same” or “what difference does one vote make?” The strategy is not meant to absolve Clark, but rather to demotivate her opponents. It’s similar to what the Trump camp did to Hillary Clinton. By calling her “Crooked Hillary” they created a moral equivalency that neutralized Trump’s character flaws while suppressing the Democratic vote. Like Trump, Clark’s core support comes from older men, who can be counted on to show up at the polls. She has a lock on a few dozen safe Liberal ridings. But she doesn’t have much room to grow. Voters are angry about the cost of living, crumbling public services and the seedy atmosphere of corruption that has permeated the government, especially around oil & gas projects and real estate. If those angry voters show up on election day — especially people under 40 — Clark’s path to reelection melts away. She needs voter turnout to stay low, preferably around the same as the last election: 55 per cent. Coincidentally, that’s the same participation rate that elected Donald Trump in the U.S. last fall. To bring about a change in government, both Greens and New Democrats need to increase voter turnout. The Greens are working to inspire voters one way: by proactively refusing corporate and union donations, leader Andrew Weaver can hold the moral high ground as Clark and Horgan slug it out. The NDP message is decidedly less idealistic: “Yeah, we take union money. And corporate cheques. But the BC Liberals are worse. And we’re your best shot at replacing them.” If elected, Horgan says his first act in government would be to Ban Big Money. Weaver says his party already has. Voters will have to decide which vision is most compelling. If you want to increase voter turnout but don’t feel like working for a party, join Dogwood’s #VoteBC calling campaign. Rather than endorsing candidates or telling people who to vote for, we focus on the basics: what ID they need, and when and where they can vote. This simple exercise in visualization has been shown to increase voter turnout by up to 10 points! * How the BC NDP has been actively trying to ban big money donations since 2009, and that John Horgan has personally put forward two bills—one as recently as February—to ban corporate and union donations and cap personal donations and each and every single time the BC Liberals let the bill die on the floor of the legislature. * How there’s a huge disparity between the amount of money that the BC Liberals rake in and what the BC NDP collects. And when I say HUGE, I mean $70 million more than any other party since 2005. Similarly they regularly accept massive donations from oil, gas, real estate developers and international corporations -and Integrity BC has determined that $1 in every $5 of their donations comes from just 30 corporations or people. Also, they’ve accepted more than $770,000 from Kinder Morgan, Dogwood’s mortal enemy. * How the only party who could win enough seats to beat the BC Liberals and ban big money is the BC NDP, and while Weaver’s stance is great, his party will win a max of 5 seats and won’t ever have enough power in the legislature to push forward the agenda that its voters want. * Lastly, wow there’s a lot to be genuinely excited and hopeful about in the BC NDP platform and commitments. Dogwood supporters can vote for them, proudly, and with confidence. And I hope that many, many, many of them do. Not a bad piece, and somewhat ironic seeing Dogwood go to bat for the USW. Anywho, its not like we did not see it coming. Kai, are you Tired? Your article makes out that Crooked Christy Clark is clever. She’s not. Her favour to the corporate forestry giants was ultra-low stumpage rates. That attracted US attention because it is BC government subsidization of lumber exports. So now she’s triggered a 23% tariff on softwood. Nice work, for a perpetual dummy. As for “donations” she returns the favor to Kinder Morgan’s $771, 000 by approving their pipeline. For Imperial Metals, it’s only $243,000 to get off the hook for a $40 million cleanup after the Mount Polley disaster and a bonus, too – a permit to dump more toxic mine waste into Quesnel Lake. What might the Steelworkers get from the NDP for their $670,000? Maybe some decent jobs! Some clever trap. Too bad Crooked Christy didn’t set a whole lot more of those! I suppose it could have been mentioned that Clever Christy (Remember the horse, Clever Hans) and her Liberals are under not one but 2 RCMP investigations around “donations” and perhaps special access and considerations from the Clark government for those putting up the cash. Who set that trap? Oh, and then there’s the BC Liberal laundering: $300,000 to Christy as a “top up salary bonus” (in addition to her $195,000 annual government salary) indirectly from the donors. This one could send her to prison. Like most criminals, not that smart. Isn’t it time that to mention that the Greens only banned corporate and union money in September – I was THERE in the 2000s when they voted down the idea “because we need the money” and we don’t want to look unfriendly to corporations. So how much actual money did the party draw from these sources before the ban 9 months ago? Just asking! Context is everything, as you know well, Kai. Otherwise, well written piece. But as an editor i would have asked for that context. Unions represent the interests of working people. Union money is hard working people’s money. People’s whose labour and skills are the foundation of our prosperity. If I were a politician I’d be proud to have their endorsement and I’d be happy to except their financial support. I find myself asking….How is that in anyway comparable to the corporate solicitation and pandering of Christy Clark’s government?